I was governor of the Pacific Northwest District in 2009-2010. It was my observation at the time that our members were not welcoming to strangers. Optimist Clubs, and other groups, get caught in a routine and if you are part of the group, you know what's going on including the inside jokes and calendar of events. I encouraged the clubs to change their ways; I advised, open the doors, put out the welcome sign, mix up the seating arrangements and get rid of the questionable jokes so that others might feel like they want to be a part of the Optimist Club. It worked. The PNW District saw almost 8% net growth that administrative year. Surprisingly, in 2010, Optimist International stumbled on the same idea and they introduced Hello, my name is Scott to our groups. If you remember, Scott is the guy who wears a nametag 24/7/365. He says that one day, leaving a seminar, he saw the wastebasket full of the nametags that people had discarded and he thought how sad that looked. Our names mean more than something to throw away. Right then, Scott began wearing his nametag and he found people to be friendlier, and more open to conversation simply because he was wearing his name on the outside, loud and proud. He made the first move to be open to conversation and others, not all, but many, took the second step to engage. Unfortunately, Optimist International did not see the marked growth from the effort as we did in the PNW District. We could make many speculations on why that was so, but I wonder if it doesn't have something to do with the fact that most people seem to be comfortable with who they are and who they know and have little room for those who are different. It's been six years since those experiments. The United States has changed since then, especially with the politics, rhetoric and policies being set forth by a new Republican administration. There are more sideways glances than ever being given to those who look different from us and the media, driven by the actions of the President of the United States, are reporting the most negative stereotypes on a daily basis. A Canadian friend shared this Tedx talk with me from the Mile High City, Denver, Colorado. In it, a charming young lady, Amal Kassir, shares a story she calls "The Muslim on the airplane." Among other things, she says we must share our names because our names tell an individual's story as only they can tell it. We can't allow others to look at us and assign our names because they may very likely get it wrong. The presentation is quite wonderful and much more profound than the Nametag Guy; but really, it's the same story. Be open to others. Embrace their differences and share yours. Your shared actions will lead to understanding and understanding will lead to peace. Over the years, some districts and/or governors in Optimist International have decided to forego the second quarter district meeting in favor of smaller zone-style meetings. I am sad to report that my home district is one of those. The thought put forward by some is that by bringing the district leaders to the zone, more members will participate in the meeting. In a district that covers more than 1,500 miles from the eastern-most club in Idaho to the western-most club in Alaska, there might be some truth to such reasoning. However, in reality, the same people tend to come, whether it is at a near or far location. Sure, there might be a few extra members at the host location, but I question whether that is enough benefit to warrant the governor and secretary-treasurer, in the PNW District's case, to be on the road for four weekends. This year, those four weekends started January 28 and end on March 18! Alternatively, on Facebook, I have noticed some Optimist International districts, WEMO, AMSNW, and OK, among others, were holding full district meetings and hosting big celebrations to recognize the Honor and Distinguished Clubs from the prior year. What a great idea! Celebrations are an important part of member retention. As humans, we need to feel that someone appreciates what we've done and as a team, by recognizing the high achieving Optimist Clubs, we will inspire others to do what it takes to be recognized too. This message is to encourage all districts to make a big deal out of Honor and Distinguished Clubs. When an Optimist Club earns Honor Club, they have proved their value to their members and community by showing excellence in administration and community service. When an Optimist Club earns Distinguished Club, they have also shown another community the impact of optimism for they have started a new Optimist Club. Both Honor and Distinguished Clubs have extended the reach of Optimist International by adding three, five or fifteen or more net members consecutively. All of which deserves a large celebration indeed. 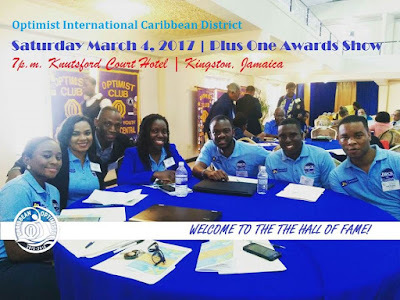 On March 4, 2017, the Caribbean District will host a Hall of Fame Plus One Awards Show to recognize their high achieving Optimist Clubs. In addition to the awards presentation, there will be general sessions featuring education to inspire achievement this year and a business session to manage the fiduciary matters and strategic direction of the district. Of course, fellowship will be enjoyed by all. Now that's what district meetings are supposed to be about. And for me, I hope to see the full district meeting model, with awards show to boot, returned to the Pacific Northwest District. I wish there had been a little more advance notice and I wish there had been a little more direction; however, my wishes are not going to stop me from celebrating Optimist Day today, February 2, 2017. It's a good idea. Wear your Optimist apparel and show your Optimist Club pride. It may be a hat, shirt, jacket or pin - whatever - Optimist International simply asks that you wear something with the Optimist International logo and celebrate your style by posting a picture on Facebook, Twitter, Instagram and other social platforms with the hashtag #OptimistDay. Sounds pretty simple. 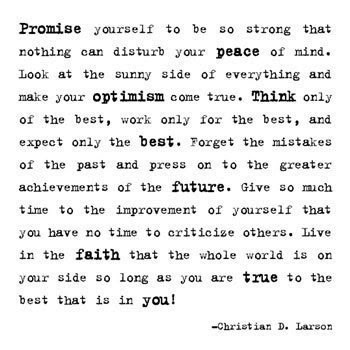 Be an Optimist and do it, okay? Next year, Optimist International, please get the word out in time to be included in a planning calendar for our clubs and districts. I might even suggest that the organization set a goal. What will we achieve by wearing Optimist-branded apparel on one day? It's rather tough to make an impact if we aren't measuring what we are doing and providing our members, and others, with the why.